5 Minutes for Mom launched a new weekly column, 5 Minutes for Food, and I’m one of the regular contributors, because I begged all foodie like “Pretty please with sugar on top!” have some mad culinary and foodie photography skills. See for yourself this Thursday. I will be sharing a recipe for Guinness Brownies with Butterscotch Fudge just in time for St. Patrick’s Day. 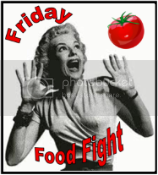 And remember, you can find additional recipes every Friday here at Run DMT at the Friday Food Fight linky party. If you weren’t hungry before, you are now. Happy snacking! This entry was posted in food, fun, Life, Wordful Wednesday, Wordless Wednesday and tagged bloggers, blogging, brownie, dessert, food, fun, Life, miscellaneous, musings, random, Run DMT, thoughts. OK, you’ve got me drooling this morning. Those look SO yummy! I’ll definitely be checking out that recipe! Those look amazing. I probably gained 5lbs just looking at them! They truly were as good as they look. I sent them off to work with hubby because I couldn’t stop eating them. I had to get them out of here! Just in time for my company’s St. Patty’s Day potluck!!! Those look GLORIOUS! Gotta have me one of those! The pretzel hooked me in all the way! OK. These look so incredibly yummy. The pretzel on the top is what hooked me. Thank you for linking up with me! Those brownies looks amazing!